Hello, I'm Bob Witt and I'm a Broker / Owner of Berkshire Hathaway HomeServices Heritage Real Estate. I was originally licensed in real estate in 1979 and have successfully assisted buyers and sellers for almost 40 years. During that time I have worked in all aspects of real estate, from residential sales to commercial properties. I've enjoyed great success in real estate including winning The Pinnacle Award (twice), placing me in the top 1% of agents nationwide. I enjoy helping buyers and sellers make their dreams come true. I'm a farm kid from Howell that enlisted in the USMC in 1973 and eventually ended up retiring from the Michigan Army National Guard as an Army Captain. I'm proud of my service to our country and will always support our military. Through my time in the service I learned about planning, and following through until the mission was accomplished. I've carried that same pride and dedication throughout my real estate career. It's true that I've sold over 1,800 properties (and have the trophies to prove it), but in honesty, nothing matters unless I cause your house to sell too. Real estate success is based on sold signs, one yard at a time, and I look forward to talking with you about your home, your goals and plans. Since 1972 Heritage has earned the respect of homeowners in Livingston County and the surrounding communities, by offering professional service to every customer and client. In 2016, we were honored to become part of Berkshire Hathaway HomeServices. At Berkshire Hathaway HomeServices Heritage Real Estate, dedicated real estate professionals work together to make a powerful sales force. As members of this team, each of us is able to be more effective in helping our customers and clients achieve their real estate goals. The outstanding performance of our office is based on our Corporate Mission, which is also a very effective philosophy for life: "Autograph Your Work with Excellence!". It's also strengthened by our use of proven Berkshire Hathaway HomeServices systems, training and tools. Many companies will try and imitate our success, but they will never duplicate our people. We're committed to these ideals. We're Berkshire Hathaway HomeServices Heritage Real Estate. 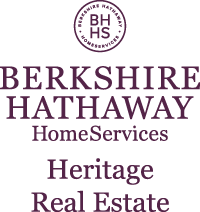 Heritage Real Estate is a brokerage member of Berkshire Hathaway HomeServices, a network brand of HSF Affiliates LLC, of which HomeServices of America, Inc.TM majority owner. HomeServices of America, a Berkshire Hathaway affiliate, is the second-largest, full-service residential brokerage firm and one of the largest providers of integrated real estate services in the U.S. HomeServices is comprised of many of the industry’s most respected real estate firms located across the nation, specializing in all areas including brokerage, mortgage, title and escrow services, insurance and relocation. For more information about HomeServices and its network of leading companies, visit www.homeservices.com.